iOS players in most countries will see icons for Cash Challenge and Cash Jam. If you do not see cash games then they're not legally available in your location or on your device. Before entering any cash challenge or cash jam you must be over 18 and accept Gumbler's terms & conditions. 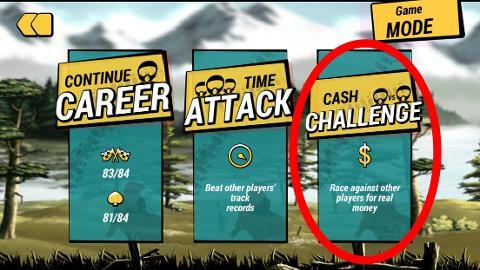 Cash Challenge can be found under Career mode and consists of two different types of challenges. Have different themes like endurance, invisible tracks, etc. 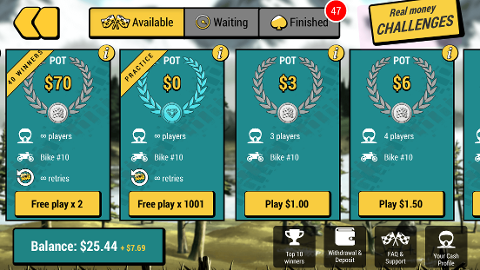 On each challenge card you'll see information for total pot size, number of players, bike number, and number of retries (if allowed). You can also hit the "i" icon on the top right corner to see additional information. Click the tabs at the top of the screen to see finished challenges, and challenges that are still active and waiting to be finished. 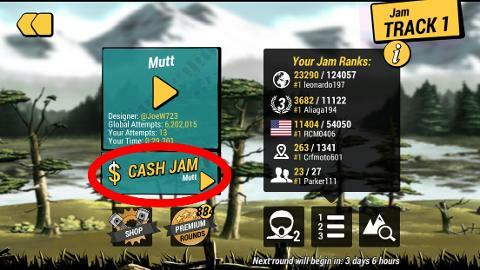 Cash Jam is just like regular Jam except each attempt costs you a small fee. The top players will win a cash prize at the end of the Jam week. Once you finish an attempt in Cash Jam you'll see the following screen. 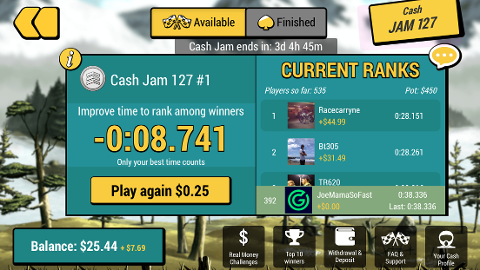 This shows your current rank, current Cash Jam leaderboard, how much you'll win, and how much you need to improve to rank among cash winners. Click "i" for more info or the chat bubble to chat with other players.